Islamic. Injuyids, Abu Ishaq as independant ruler. AD 1337 to 1354. Silver Dirham. 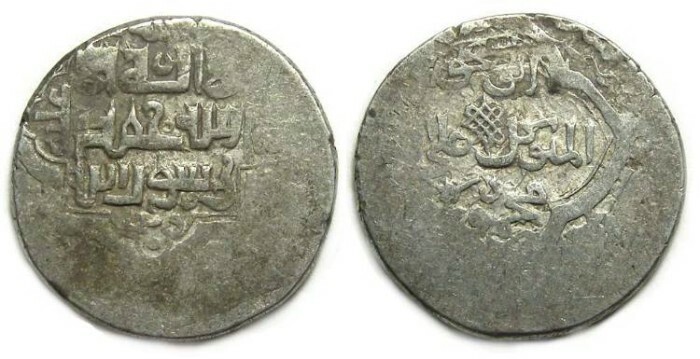 Ruler : Al Mutawakkil Abu Ishaq ibn Mahamud, ruled at first as a vassel of the Ilkhan king Abu Said, but on Abu Said's death in AH 736 (AD 1337) Abu Ishaq became an independent, but this only lasted 18 years when he was driven out by the Muzaffarids. Mint and Mint : no mint or date is visible on this coin, which is normal for this very crudely struck type. Reference : Album-2275.2, Mitchiner Islamic #1734. Size : 19.0 x 19.1 mm. Weight : 3.57 grams. Grade : VF for wear, but with the typical incomplete strike.